Perhaps the very last Vantage before it's discontinued. Dating back to late 2013, rumors began about a potential Aston Martin Vantage GT3 road car in development. In essence, this would be an even more extreme version of the Vantage V12 S. The production rumors were more or less confirmed by some prototypes caught testing last fall, but only now has the UK sports car builder confirmed the GT3’s existence. This new teaser makes it quite clear. Set to debut this March at Geneva this is the fully street legal Vantage GT3. 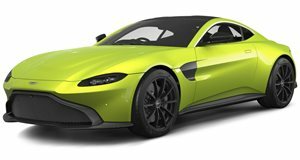 Aside from the brief video, AM hasn’t released any official specs or other details, but it’s safe to assume the following: that familiar 6.0-liter V12 could be tuned to produce as much as 600 hp, up from the current 565 ponies in the V12 Vantage S.
An updated automated-manual gearbox is also expected, allowing for faster shifts and a 0-62 mph time of roughly 3.5 seconds. A stripped-out interior and a combination of aluminum and carbon-fiber bodywork will further reduce weight. There’ll also be flared wheel arches front and rear to accommodate the wider tires. It all sounds quite wonderful and more details should be coming in shortly.